Fire top kills honeysuckle, but does not kill the root. We have burned our Bennett woods unit annually for about a dozen years. 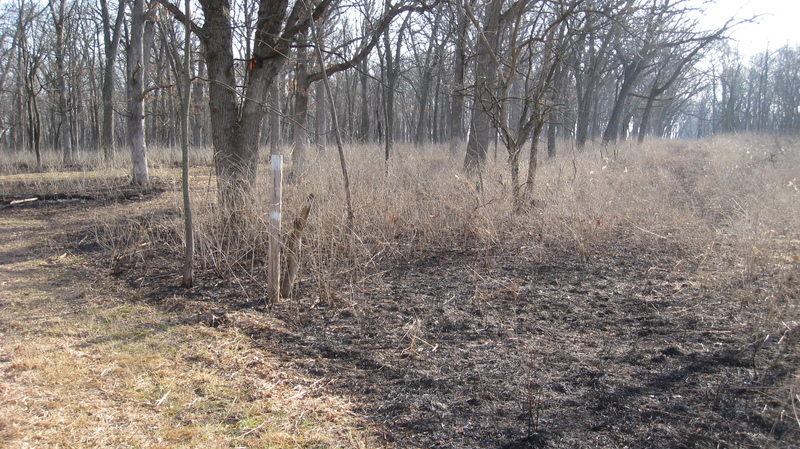 The fires top kills most of the honeysuckle, with some plants not affected because they were next to big logs or other fire breaks. 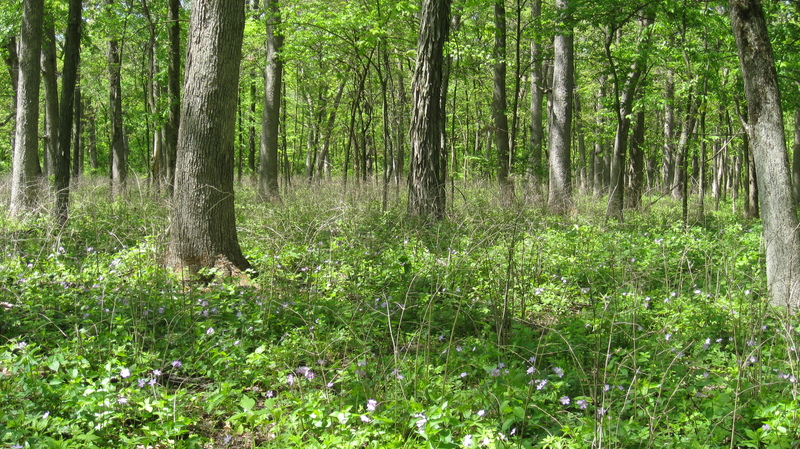 Below is a typical photo of the Bennett woods after a fire. Here the photo is April 1, 2010. The ground layer shows black, the shrubs might be top killed or not, we can’t tell yet. Look at how many waist high shrubs are there! Photo below is from the same area but a few weeks later, May 3, 2010. The lovely wild geraniums are in bloom! Look at the all the honeysuckle stems with no leaves on them. The fire top killed them. Does fire control honeysuckle? Sort of. If you were to kneel down by those honeysuckle plants you would see something like the following photo. Here the top killed honeysuckle stems have no leaves, but the plant is sending up several new stems. This is an April 18 image. 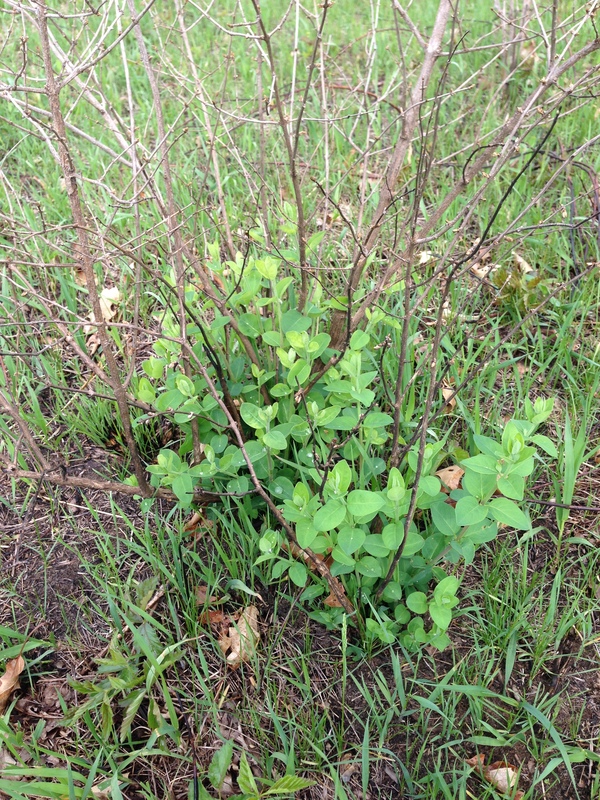 Below is a May 7, 2016 photo showing robust growth of honeysuckle, even though the stems of the previous year are leafless and lifeless. Fire does not kill the roots. Shrubs evolved to take fire and grazing. I have walked our Bennett Woods unit carefully every year for nine fire years. By mid-May, I can’t find one invasive honeysuckle that has not re-sprouted. Not one! What would a lifeless honeysuckle look like? 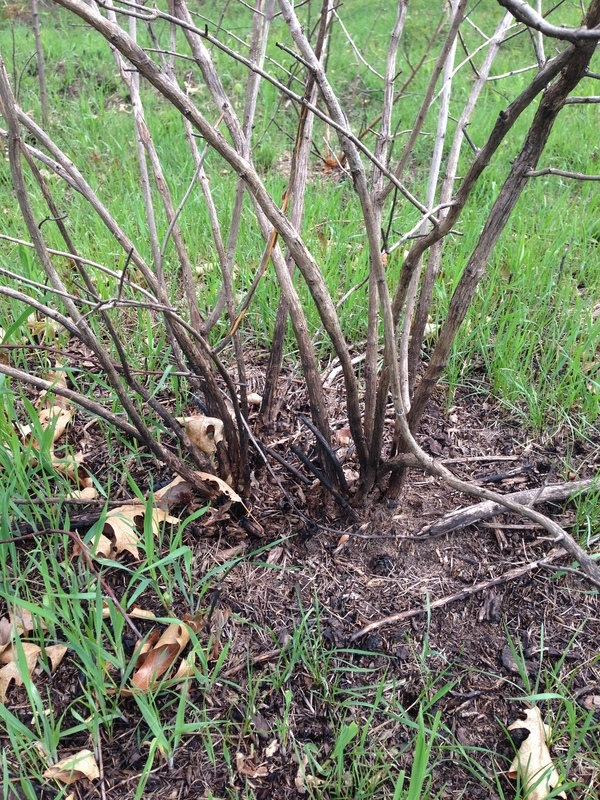 The photo below shows a plant that died from a herbicide application. Dead stems, no re-sprouts. Fire does not kill honeysuckle. Fire does set it back, top killing stems, and making the plant re-sprout. It takes two to three years for the shrub to become big enough to produce a flower and a fruit full of seeds. So annual or bi-annual fire offers an opportunity to keep the stature of the plant low which allows other plants like sedges, grasses and forbs to get a leg up. And the shrubs are not producing fruits and seeds for a few years. Also, the shrubs are a smaller target to apply herbicide to. End. 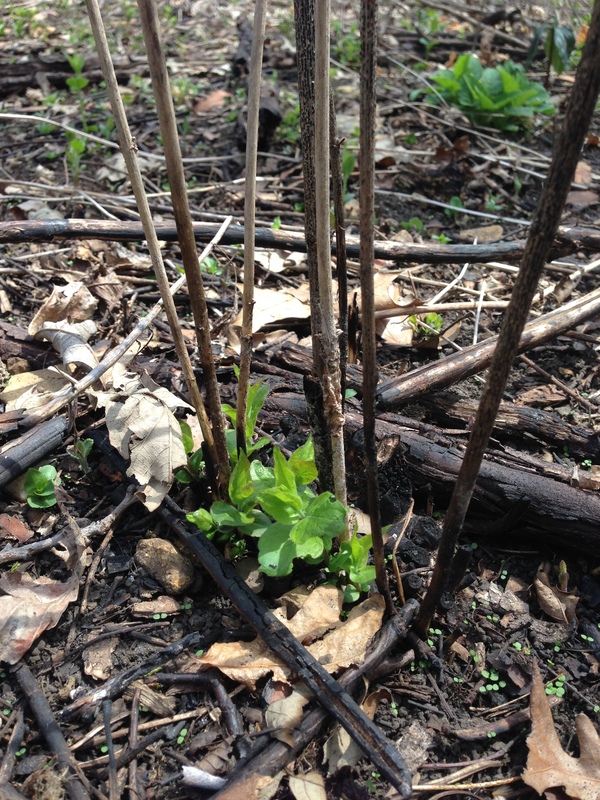 This entry was posted in Uncategorized and tagged fire, GRN, honeysuckle, invasive, shrub. Bookmark the permalink. Yes, I’m not a member of the Grassland Restoration Network, but as always, this emails is useful information for me. In more than one small prairies I maintain I’ve treated cut honeysuckle stumps with Phylosophate and apparently had good, permanent results. I’m surprised and disappointed that over several years you’ve treated invasive honeysuckle by burning,. But I do know that because of a number of reasons you are unable to treat all invasives in the best known ways so can conduct long-term experiments on outcomes. This email is useful for small prairie-guys and I’m sure for the full time prairie managers, too. In my experience I seem to have had good results of using glyphosate on cut honeysuckle stems and also in using glyphosate on sproutings of Autumn Olives. My Autumn olives were extracted with a back how about 3 years ago so I’m now able to deal with what comes up. Sometimes it’s just by cutting low and dabbing with glyphosate, but I’ve also dug deep with a spade or ax to remove more roots. I’m fortunate to deal with a tiny prairie on which one person’s activities can show good results the next season. I’m aware I’m not a member of the grassland restoration network but I encourage you to keep me on your mailing list and would greatly appreciate an opportunity to help when the GRN occurs at Nachusa and within a few states! Yep, I agree glyphosate concentrate on cut stems kills the roots of most any plant. Tearing them out works too. I have a few more posts on this topic. My main point is there are ways to manage this shrub, but it takes time and persistence.